Mutual Trust Bank Limited (MTB) has recently been awarded the ADB Gender Champion Award as part of Asian Development Bank’s Trade Finance Program (TFP) 2018. 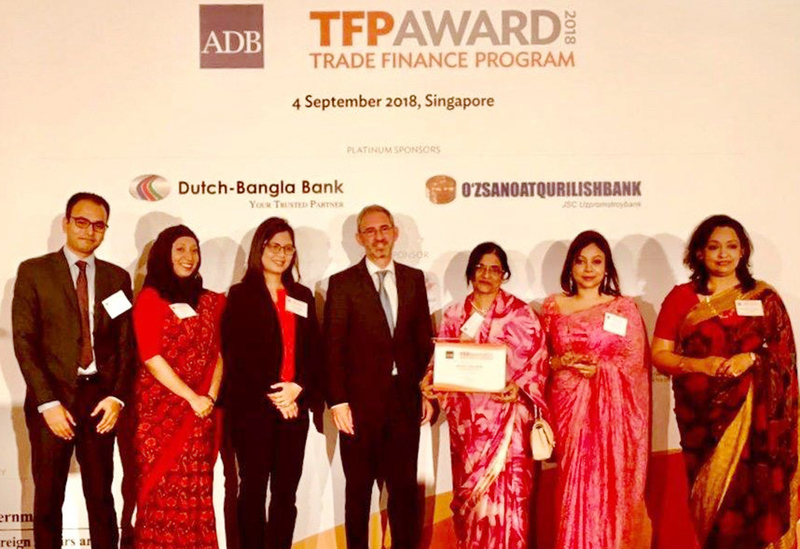 The award was handed over at a ceremony held on September 04, 2018 at InterContinental Hotel, Singapore at which the MTB Vice Chairman, Khwaja Nargis Hossain received the award on behalf of the bank, and at which event, and senior female officials were also present. The MTB Vice Chairman termed the award as a strong recognition of the bank’s continued focus on supporting the career trajectories of women at MTB. She underscored this award as a big push for women in the workplace to be granted equal and full voice in every aspect. Mutual Trust Bank Limited (MTB) aspires to be a top employer of the best talent and in the process creating the right conditions for women to succeed, to challenge and enable them to do their best work and reward them for doing so. Gender equality is a key factor in achieving this goal and is a priority of the bank’s diversity and inclusion strategy. This award will serve as a fillip in MTB’s efforts to improve gender parity at the bank.